Are There Herbs That Cleanse the Spleen? Your spleen is used to filter blood, produce red blood cells and provide lymphocytes and antibodies for your immune system. Most people seem to function fairly well when they lose their spleens, which are very sensitive to trauma. The idea of cleaning the spleen originates in traditional Chinese medicine and can be approached in various ways. Some herbs promote oxygenation of the blood, which has a cleansing effect on all your tissues and organs, while others are thought to directly stimulate or "energize" your spleen. Always work with your doctor to determine what, if any, herbal remedies are right for you. Your spleen is located in the left upper quadrant of your abdomen, below your heart. It filters your blood, removing old red blood cells, immune cells and debris. Although your bone marrow produces most of your red blood cells, your spleen produces some and actually stores a reserve of blood in case of hemorrhagic shock brought on by heavy bleeding. Your spleen also recycles iron by breaking down hemoglobin, synthesizes antibodies and white blood cells, removes bacteria, and filters lymph fluid. In fact, your spleen is much like a large lymph node. Any herb that cleanses your blood from pathogens, promotes oxygenation, removes excess fluid from your body or enhances the function of your spleen has a cleansing effect on it directly or indirectly. 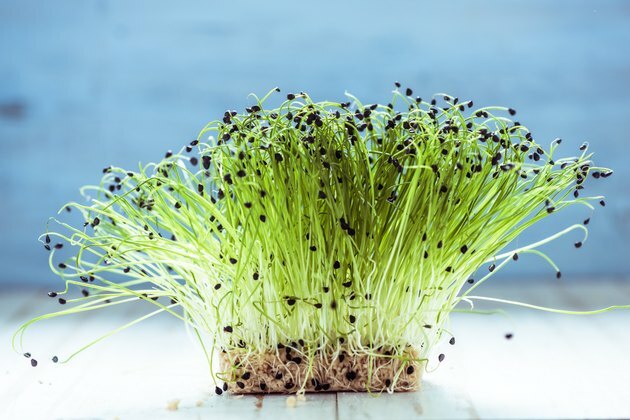 Wheatgrass is rich in chlorophyll, which is the green pigment plants use for photosynthesis. The composition of chlorophyll is similar to blood, and once ingested, it stimulates hemoglobin and red blood cell production, according to the text "Biochemistry of Human Nutrition." Red blood cells carry oxygen, and high oxygenation of tissues stimulates metabolism and deters the growth of pathogens and cancer cells, which require low-oxygen environments. Healthy red blood cells reduce the workload of your spleen, and the extra oxygen has a cleansing and protective effect. Wheatgrass also contains vitamin B-12 and iron. Consult with your doctor before taking any supplements. Alfalfa is another rich source of chlorophyll, but also a very good source of iron. Iron gives your blood its red color and is needed for hemoglobin production. Iron deficiency leads to anemia, which taxes your spleen. Alfalfa also contains vitamins C, B-12 and folic acid, which promote iron absorption. Further, B-12 and folic acid are needed to produce healthy red blood cells, and deficiency in these vitamins produces malformed cells that clog and congest your spleen. Talk to your doctor before using alfalfa. Sheep sorrel is one of the most potent antioxidant herbs known, as it is rich in vitamins C and E, anthraquinones, beta-carotene and other carotenoids, according to the book "The New Healing Herbs." Antioxidants scavenge and eliminate free radicals and toxins from your blood, reducing damage and deterioration. Sheep sorrel also contains chlorophyll and many antibacterial substances, such as citric, oxalic and tannic acids. Further, it is a good diuretic and removes excess fluid from the body, which has a cleansing effect on your lymphatic system and spleen. Check with your doctor before using any sort of supplement, though, to ensure safe and proper usage. Other blood cleansing herbs that display antioxidant, anti-inflammatory and antimicrobial properties include red clover, burdock root, chaparral leaves and pokeroot, as cited in "The Essential Book of Herbal Medicine." Because your spleen is in constant contact with your blood, blood-cleansing herbs directly cleanse and protect your spleen. According to traditional Chinese medicine, your spleen's energy also works to ensure proper digestion, absorption and transportation of nutrients, as well as moderating mood, especially anger. As such, certain herbs are thought to enhance the energy, or "chi," of your spleen, which enhance, nourishes and cleans it. Examples of herbs recommended to stimulate your spleen include Ling Zhi, Zhi Ke, Chao Huang Qi, Shan Yao and Bu Zhong Yi Qi Tang, according to "The Complete Book of Chinese Medicine." These herbs also stimulate your kidneys, stomach and liver in most cases. Contact a health practitioner familiar with its use for dosing guidelines for your individual needs. What Vitamins, Herbs or Minerals Help Your Body Detox?